• 8 weeks, 6 days/week. Last week is a taper week with significantly less volume. • Assessments scale the program to your ability. Intense, sport-specific 8-week program is specifically designed to prepare athletes for the US Border Patrol’s BORTAC Selection. The plan includes a 1-week taper, and is designed to be completed the 8 weeks directly prior to your selection start week. This is a very intense, 6-day a week training program with high levels of volume and stress. To successfully complete this program you’ll need to make training for selection a priority during your work day. 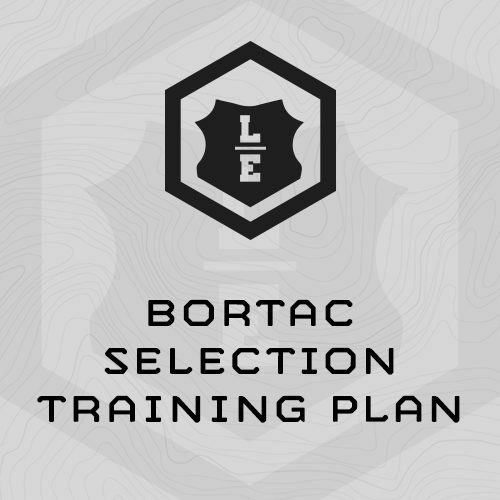 This plan is “sport specific” to the fitness demands you’ll face at BORTAC Selection – rucking, running, swimming, work capacity “smokers,” grip strength, etc. - Stop Watch with Repeating Countdown Timer - Timex Ironman is best. - Highly Recommended - GPS-enabled Stop Watch with repeating countdown timer. A GPS enabled watch will make measuring run and ruck distances and pacing, much easier. (3) 4 Rounds, every 60 sec. (4) 6 Rounds, every 60 sec. Max reps Pull-ups in 60 sec. Use the below chart for Bench Press loading …. 300m Shuttle Run in IBA, every 2 min, 30 Seconds. I just got selected for BORTAC! I finished your BTC Selection program that I had purchased a couple of years ago and it did the job.